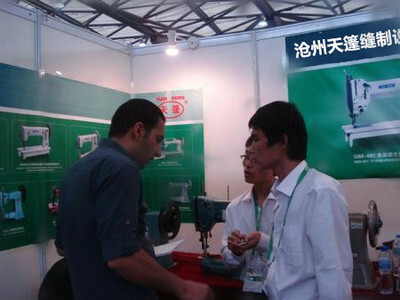 Cangzhou Tianpeng Sewing Equipment Co., Ltd is the diversification modern enterprise for producing sewing machines for thick material. It has combined management system with research, development, design, manufacture, test, quality guarantee, marketing and after-sale service. It mainly used in sewing thick thread, thick material and super-thick material for contain bag, shoemaking, sofa, jeans wear, linen wheel, canvas and leather. “Tianpeng” brand series super-thick leather products won acclaim from all customers by the unique innovating design and reliable performance. In 2001 the company passed ISO9000 international quality system certification. Customer groups include: quantitative packing scale manufacturing enterprises, enterprises bulk material packaging machine, all kinds of packing bags manufacturers, FIBC manufacturers, carpet, car seat manufacturers. All staff members of Tianpeng Company sincerely hope to cooperate with friends in domestic and abroad for common future by the spirit of advance with times, technological innovation, wish a future of excellence and honor credibility. We welcome all customers to visit us.